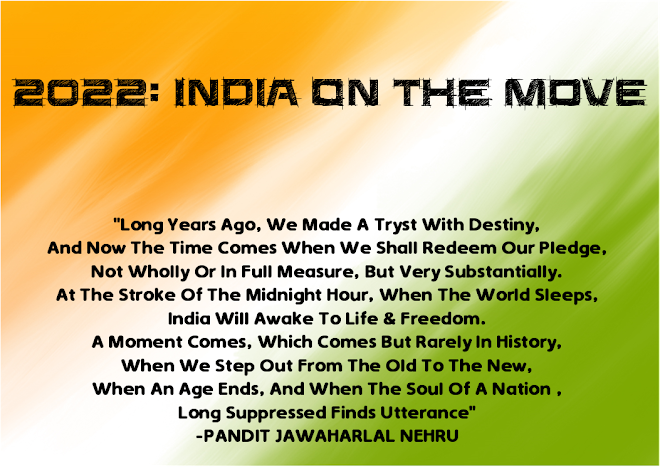 Twenty22-India on the move: ISRO hits a Century! At about 10 am on Wednesday, India's nearly 50-year-old space programme rocketed into record books by successfully deploying 104 satellites in orbit--a feat not accomplished by any country so far. The record-breaking mission, which has been six months in the making, will be one for history books. 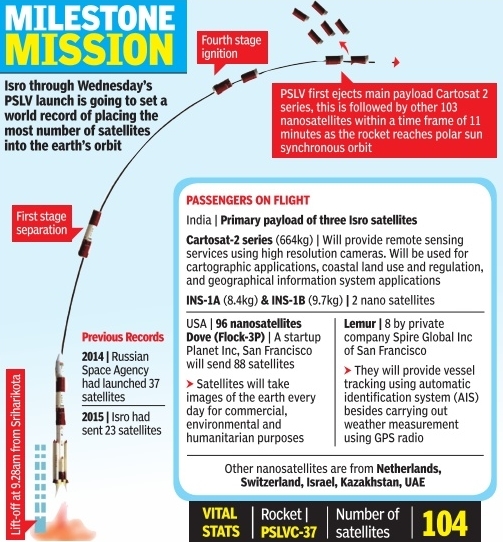 It began at 9.28 am with a thunderous lift-off of the advanced version of the four-stage Polar Satellite Launch Vehicle, designated as PSLVC37, at the Satish Dhawan Space Centre, Sriharikota. 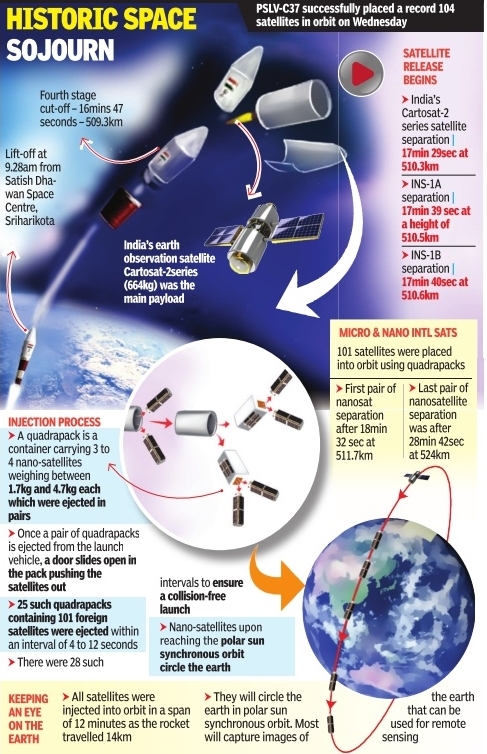 The 104 satellites consisted of three Indian satellites, including the 714 kg Cartosat-2 series satellite, and 101 international co-passengers which included nano and micro satellites. After the launch, both President Pranab Mukherjee and Prime Minister Narendra Modi congratulated Isro. For Isro, it was a giant leap from 20 to 104. On June 22, 2016, it had placed 20 satellites in orbit in a single shot which gave it confidence to raise the number of satellites it can fly. In Wednesday's mission, the total weight of all the 104 satellites flown was 1,378 kg. Considering the complex nature of the mission, in the moments prior to the takeoff, the mood among the scientists and engineers in the mission control room was a mix of confidence and a degree of apprehension. About 30 minutes before the launch, the weather was a `go' and a few minutes later came an announcement that the mission computers and all the tracking stations were ready for the flight. Then came the much awaited countdown. The rocket emerged through the thick jungle around the launch pad. For a few moments, it was soundless. As the rocket pierced the morning sky, leaving behind a yellowish plume of smoke, the area reverberated to the thunder and roar of the vehicle. 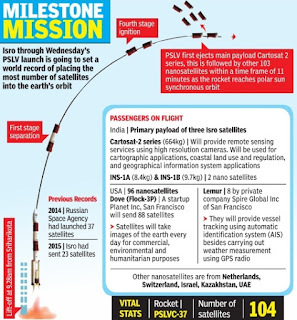 Nearly 17 minutes and 30 seconds into the mission, when the rocket hit a velocity of 7609.52 metre per second, the prime payload, the indigenous Cartosat-2 series satellite separated, evoking loud applause in the mission control room. Within seconds, the other two Indian satellies, Isro nano satellites, went into orbit. At 18 minutes and 32.80 seconds, the first pair of foreign nanosatellites separated, and half-an-hour after lift the last pair was placed into orbit. A new world record had been created in space. All satellites were placed in a 505 km polar sun synchronous orbit.